Swiss President Hans-Rudolf Merz met on Sunday with his Iranian counterpart Mahmoud Ahmadinejad in Geneva, a day before Jews worldwide commemorate Holocaust Remembrance Day. I can understand that, for obvious real politick, economic and "protocol" reasons, the president of a democratic country meets with a known Holocaust denier who also calls for the destruction of Israel. I can also understand that UN Secretary-General Ban Ki-moon "regrets" the absence of the United States and eight other Western nations from the UN conference "on racism." He, to be sure, never criticized Iran and its president for calling for the destruction of another member state of the United Nations, precisely Israel. What is difficult to understand is why the Swiss judicial authorities did not inform their president that Iran's highest authorities are responsible for at least two assassinations of Iranian opposition activists on Swiss soil. In April 1990, Kazem Radjavi was assassinated in Coppet, Switzerland. He was a renowned human rights advocate and elder brother of Iranian opposition leader Massoud Rajavi. In April 2006, the Judge of the canton de Vaud Jacques Antenen issued a warrant arrest againstformer Iranian intelligence minister Ali Fallahian concerning this affair (see at http://www.tsr.ch/tsr/index.html?siteSect=200001&sid=6617142). Ironically, Kazem Rajavi was Iran's first Ambassador to the United Nations headquarters in Geneva following the 1979 Islamic revolution. Shortly after his appointment, he resigned his post in protest to the “repressive policies and terrorist activities of the ruling clerics in Iran”.He then intensified his campaign against mass executions, arbitrary arrests, and torture carried out by Iran’s theocratic leadership. At the age of 56, he held six doctorate degrees in the fields of law, political science, and sociology from the universities of Paris and Geneva. In August 1987, Col. Ahmad Moradi-Talebi was assassinated in Geneva, Switzerland. A former member of the Iranian Air Force and an F-14 pilot, he was reportedly against the current regime’s ideology and wanted a more democratic government in Iran. 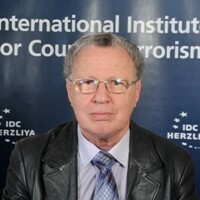 This commentary has been cited in the Spanish daily ABC under the title "Israeli intellectuals remember the death of iranian opposition activists in Switzerland."